Dr. Alejandro Kovacs, of Pinnacle Implants & Periodontics, proudly announces investment in two iCAT™ cone beam CT imaging units. This technology improves the patient experience and captures precise images that help diagnose oral conditions and plan the precise placement of dental implants in Texarkana, TX. A supporter of modern medicine techniques and equipment, Dr. Alejandro Kovacs, is proud to bring the latest iCAT™ cone beam CT (CBCT) imaging technology to each of his two practice locations in Texarkana and Longview, TX. Dr. Kovacs, one of just four specialists in the country dual board certified as a periodontist and prosthodontist, has a history of bringing leading-edge choices to patients like the 3D CBCT technology and software. He is also respected as a provider of leading dental implants in Texarkana, TX and Longview, TX. The iCAT CBCT offers fast, convenient and comfortable 3D high-definition images that showcase the complete bony structure of the oral cavity. Within seconds, the non-invasive machine generates clear pictures to ensure accurate diagnosis and treatment for patients of all ages. Its benefits include quick scanning in as few as 10 minutes and only 10-percent of the radiation exposure of traditional x-rays. Other dental professionals have given the iCAT CBCT high marks for increasing the comfort of patients and treatment outcomes during even complicated procedures. Dr. Kovacs uses this advanced imaging technology to improve a wide range of services, including treatment of oral infections, TMJ analysis, and impacted teeth. Also capable of conducting an airway study, this unit analyzes each patient’s unique air passage, aiding in the diagnosis and treatment of sleep apnea. In addition, the iCAT CBCT offers guided implant placement for patients who receive dental implants in Texarkana and Longview, TX, at either of his modern offices. For more than 15 years, Dr. Kovacs has systematically upgraded his equipment in an effort to remain at the forefront of dental medicine. To help patients who may experience dental anxiety, he and his team provide sedation dentistry choices for increased relaxation and comfort. Dr. Kovacs is now accepting new patients interested in dental implants in Texarkana or Longview, TX at his practice, Pinnacle Implants & Periodontics. Appointments can be made by calling 903-758-3329 or by visiting http://www.pinnacleperio.com. Pinnacle Implants & Periodontics offers comprehensive periodontal care for patients in Longview and Texarkana TX. Dr. Alejandro Kovacs is a Diplomate of the American Board of Periodontology, the American Board of Prosthodontics as well as the International Congress of Oral Implantologists. 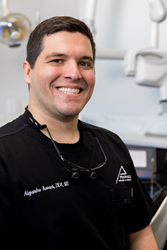 As one of only a few dual board certified clinicians in the nation practicing as a periodontist and prosthodontist, he offers cutting-edge services including dental implants, laser gum disease treatment, gum recession care and full mouth reconstruction. To learn more about Dr. Kovacs, his team or the services they offer, visit http://www.pinnacleperio.com or call Pinnacle Implants & Periodontics at 903-758-3329 for the Longview location or 903-838-0511 for the Texarkana practice to schedule a personalized consultation.